Mr Kiplings recent seasonal offerings, gingerbread and mince pie (both are amazing but the mince pie one is better in my opinion), had me craving these home made versions and meant I got to use my favourite kitchen toy. 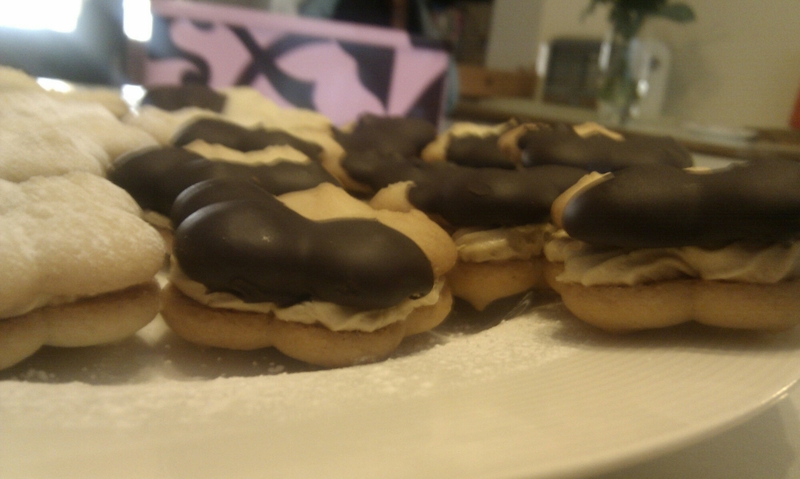 This recipe from the Hairy Bikers makes the most moreish Viennese Whirls. 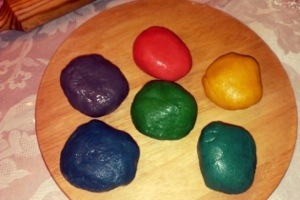 They are also very easy to make, which is great, as you will want to make them often. Combine all the ingredients for the biscuits using your electric whisk/food processor until smooth and completely combined. Now this is where my favourite toy comes out. The first time I made these I found them really difficult to pipe and my hands really hurt, so I gave up and just made them into rounds. Same taste but they looked kinda boring. I was gifted with this Kuhn Rikon Cookie Press. It effortlessly makes cute little shaped biscuits. I absolutely love it and can’t recommend it enough. 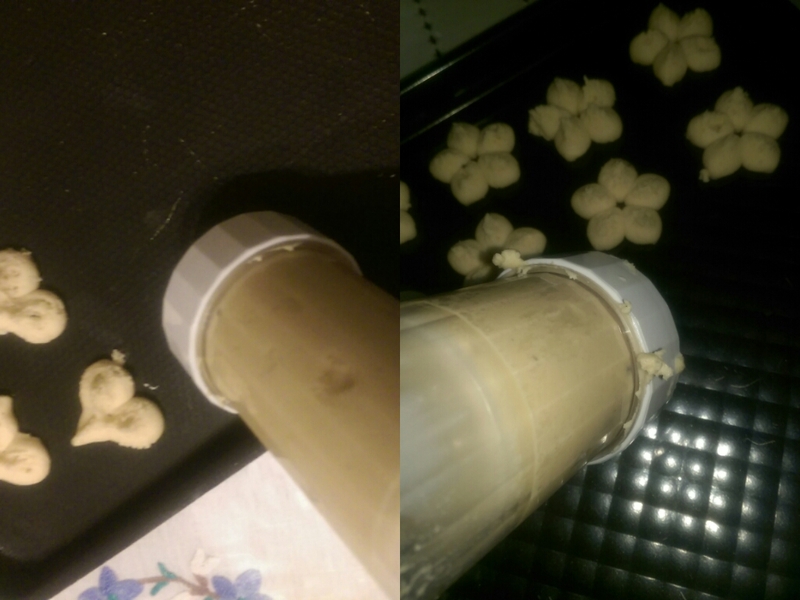 It’s so easy to use/clean and the resulting biscuits look soo amazing. However, I’m not a huge fan of the recipes that were included in the box, but it’s perfect for Viennese Whirls, no painful piping and you still get beautiful biscuits. The biscuits come out more consistently if the trays are chilled, I also find it easier with the textured trays as pictured. Bake until the edges are golden. 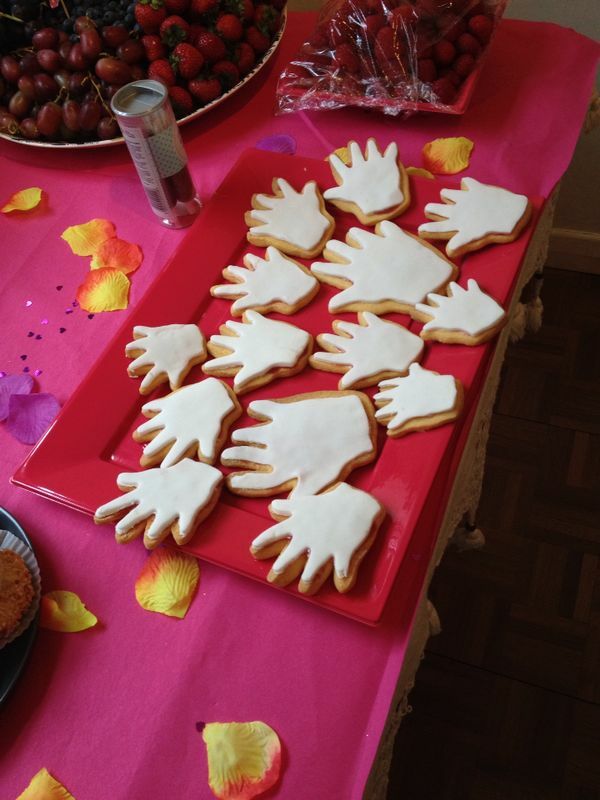 These biscuits alone are AMAZING. So buttery and moreish. 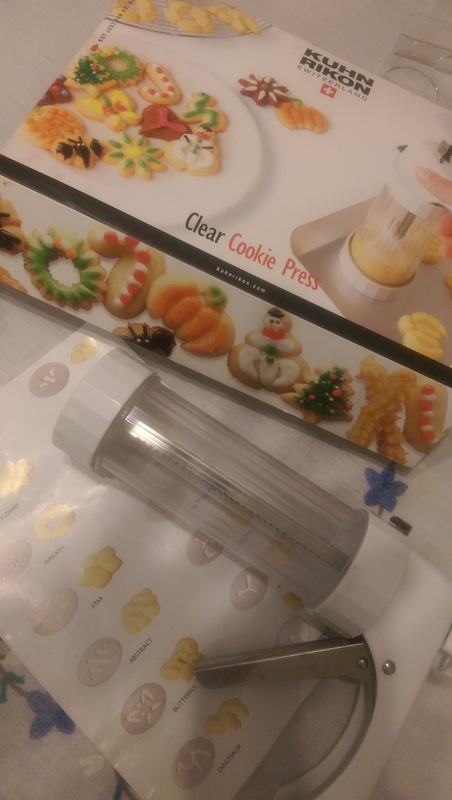 It’s a good job with the cookie press they are small so you get a lot more than the 18 sandwiches suggested in the recipe! 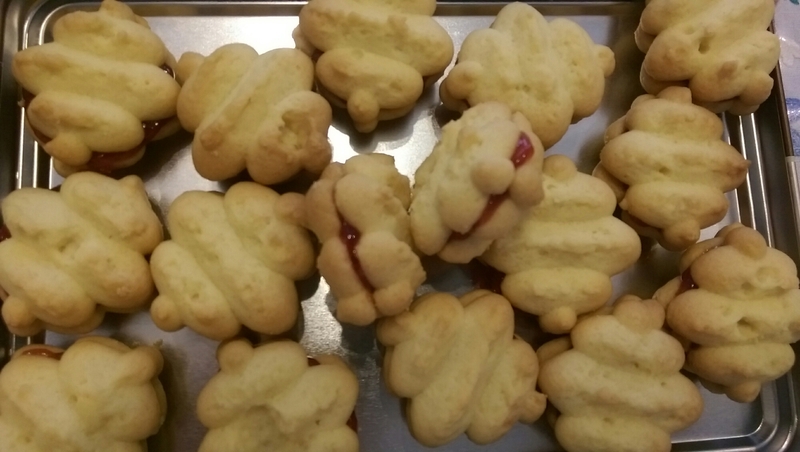 Make your buttercream and pipe on to a biscuit, put some jam on top and sandwich with another biscuit. 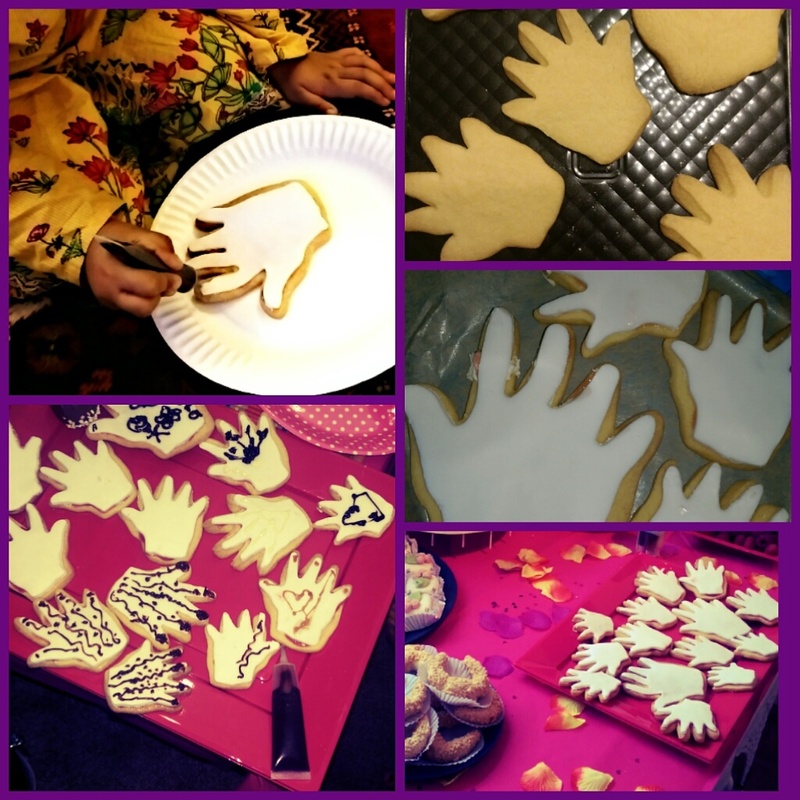 A sprinkling of icing sugar and eat! 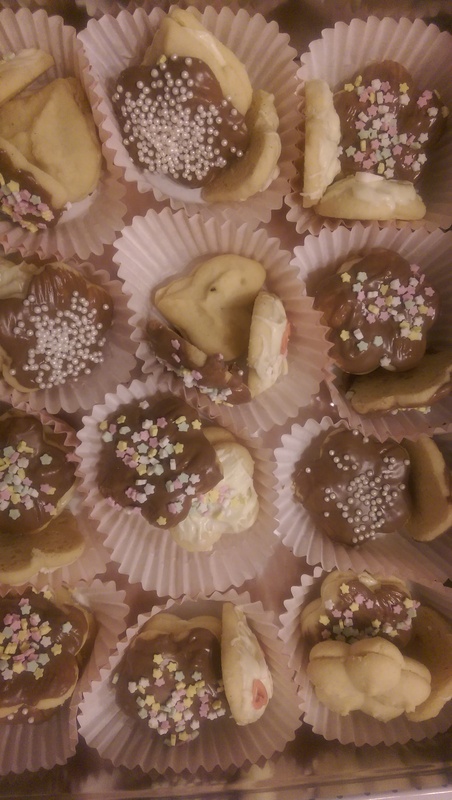 The recipe is incredibly versatile and you can add different flavouring to both the biscuit and buttercream; the ones pictured are a vanilla biscuit with a mocha buttercream. 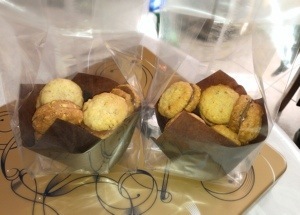 You can also substitute the jam with nutella/caramel etc to compliment your flavour combo. 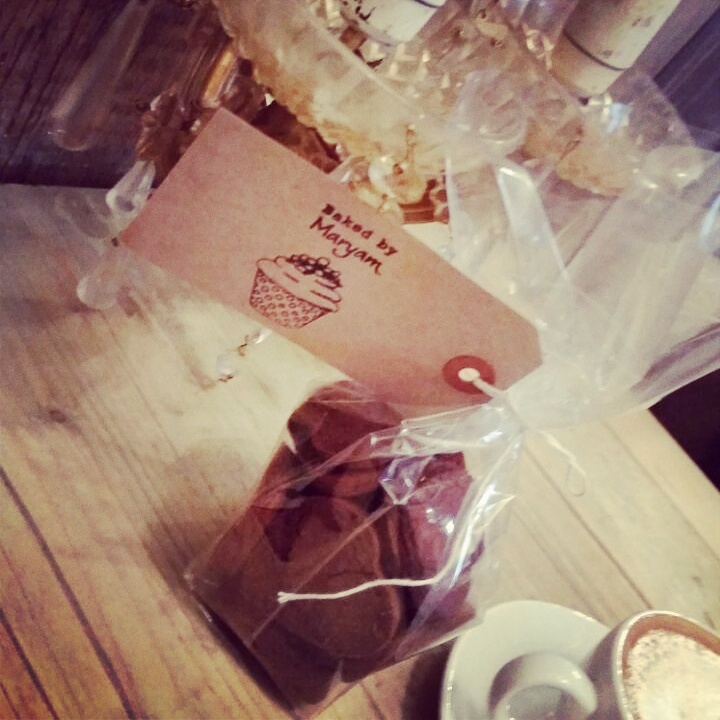 You can also substitute the cornflower with custard powder, filled with vanilla buttercream and jam… Simply divine! 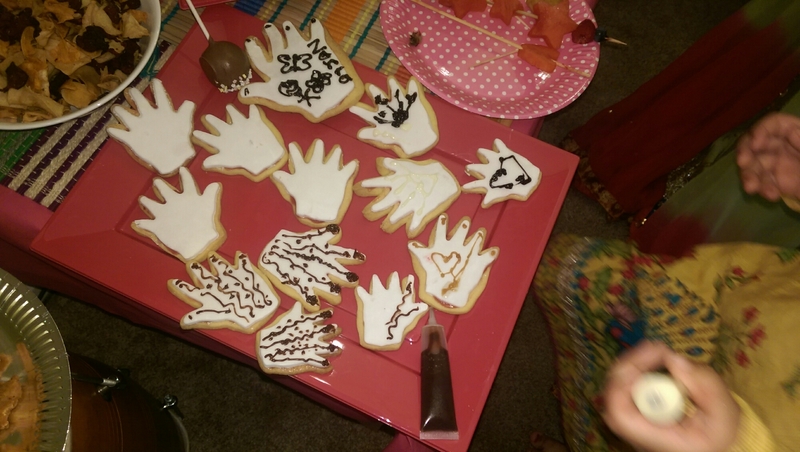 They can also be dipped in chocolate to be extra indulgent. 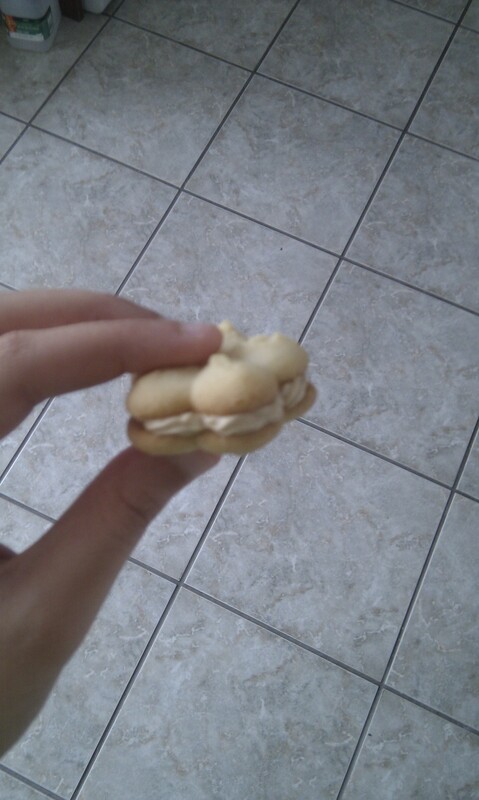 Or if you want something abit ‘lighter’ you can omit the buttercream/filling. P.S. I was in Lakeland recently and found this cute springtime cookie disc set … And it fit in my Kuhn Rikon press! Haven’t had a chance to use them though. P.P.S. 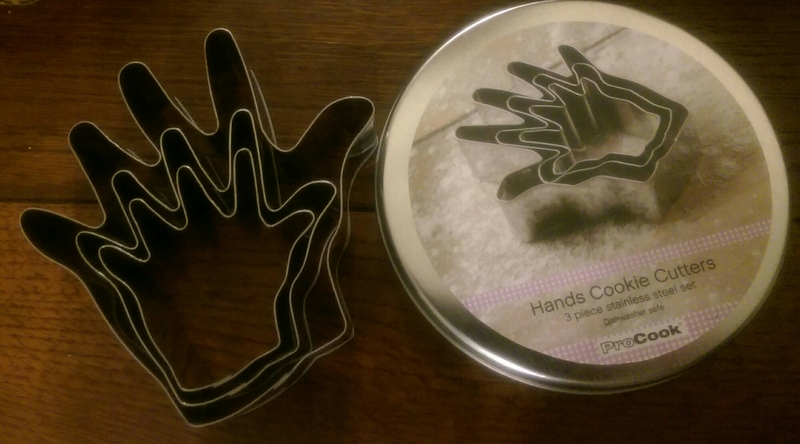 they don’t seem to be selling the Kuhn Rikon Cookie press at Lakeland anymore,however, they have this OXO set, and its £5 off…yay! 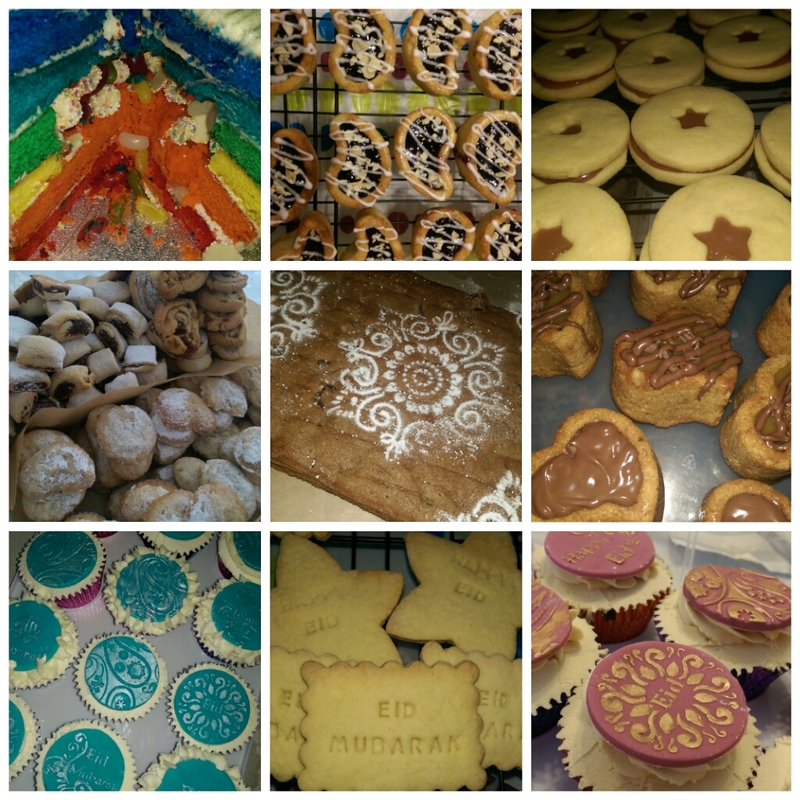 This entry was posted in biscuits, Cookies and tagged biscuits, butterbiscuits, cookiepress, cookies, dairyfree, homemade, kuhnrikon, mrkipling, oxo, vegan, Viennesewhirls, whirls on January 9, 2015 by maryambakes. 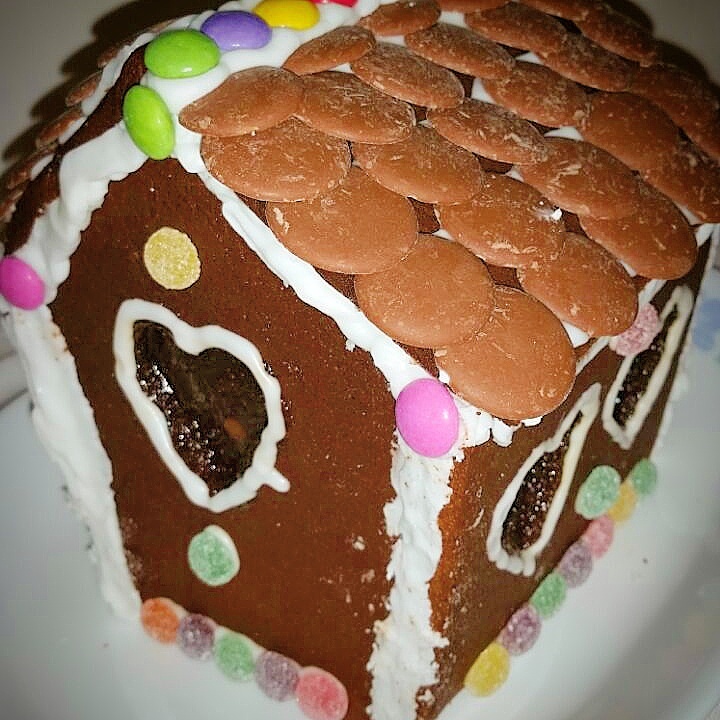 Ever since I’ve got into this baking thing… I’ve been telling myself I have to make a gingerbread house. I absolutely love gingerbread houses. 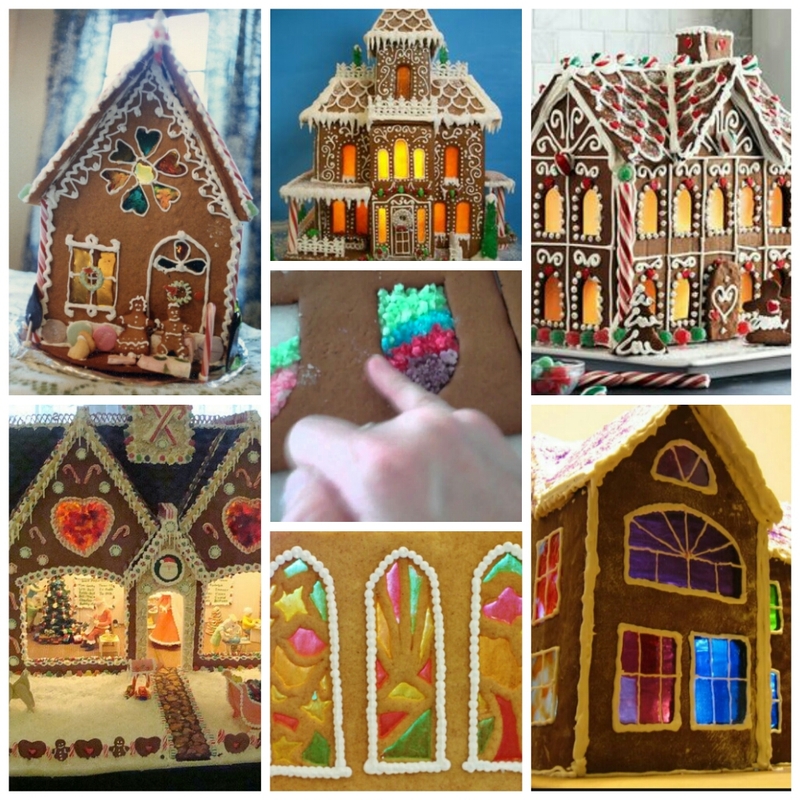 I could spend hours on pintrest looking at the gingerbread mansions/villages/cities. 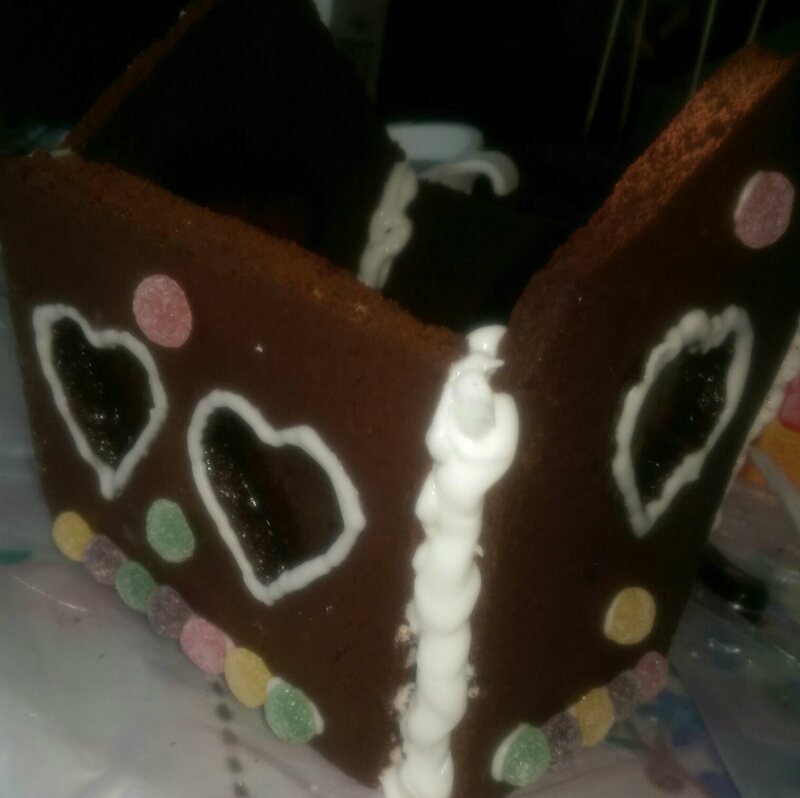 I decided to go with a chocolate gingerbread house and used this recipe, substituting 50g of plain flour with cocoa powder. 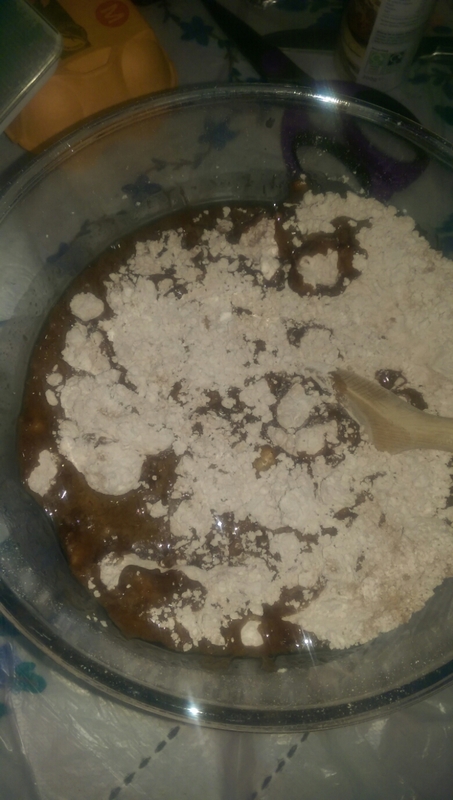 I also added a teaspoon of ground cinnamon and half a teaspoon of all spice. 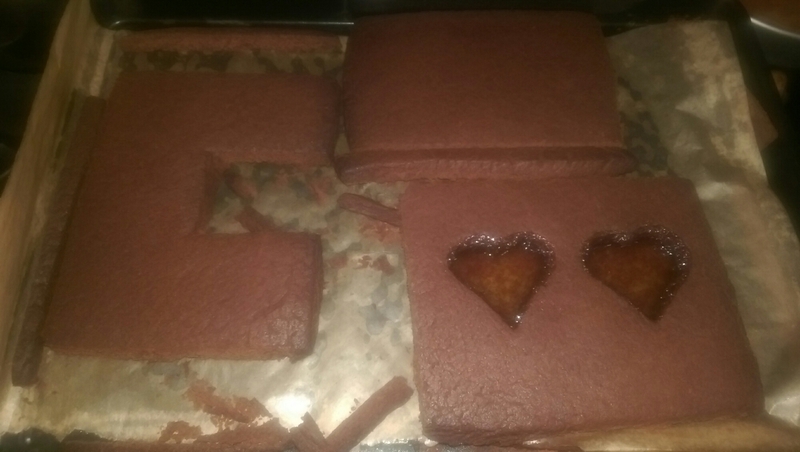 I’m not really sure why but I always thought making gingerbread would be really difficult but the dough was ready pretty quickly and no chilling required. 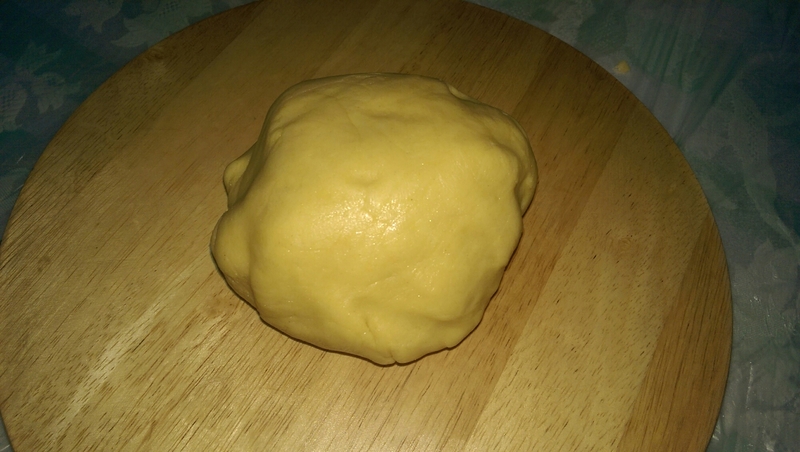 The dough itself was quite greasy, but the made it easy to roll and no messy/stickydough fingers. 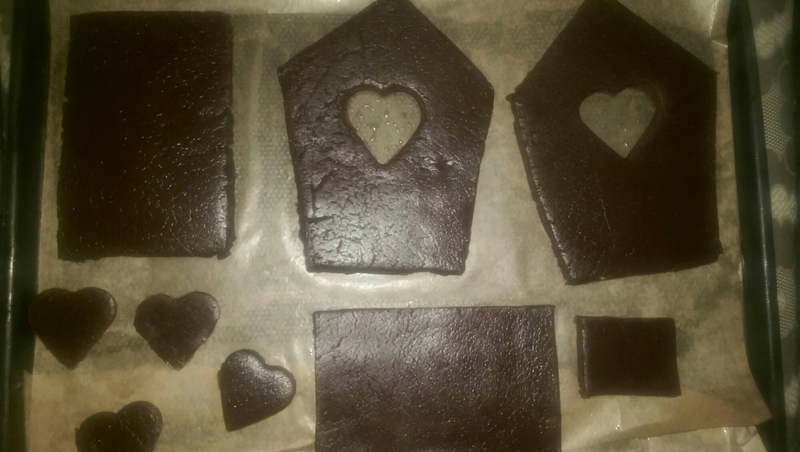 I decided my house had to have windows and used hardboiled sweets to fill the heart cutouts. Some of the houses I’d found online had the most beautiful stain glass windows and I really wanted to recreate them (ambitious much?!). Unfortunately, I’m a proper weakling, and didn’t get very far bashing my sweets with a rolling pin, so ended up having to put whole sweets of the same colour and hoping for the best. I left the them to bake for 5mins longer than advised just to make sure they wouldn’t be too soft. 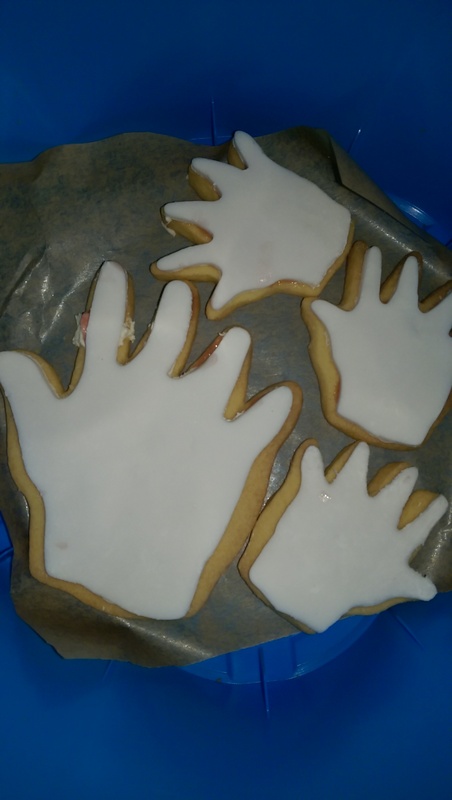 After taking them out while still fingerburning hot, I cut around the templates as the dough had spread abit during baking. 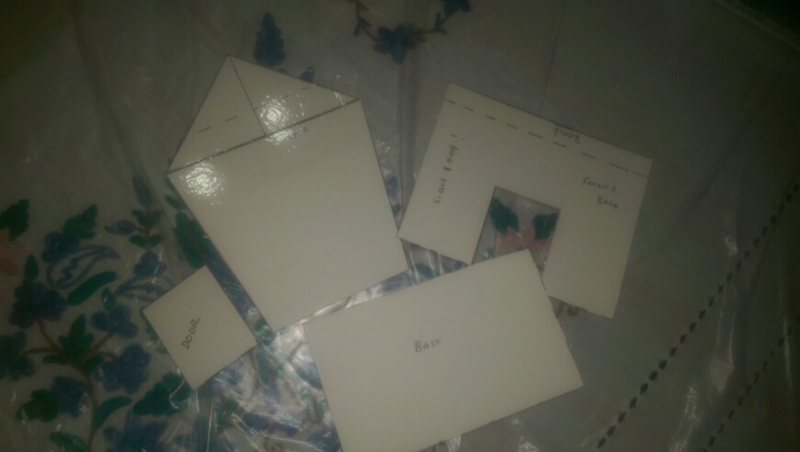 I decorated the pieces before constructing the house. I used royal icing, jelly tots and some white chocolate heart sprinkles. 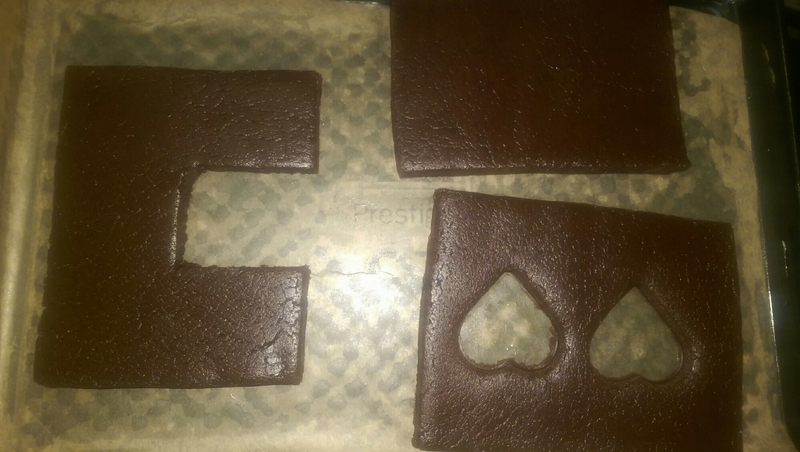 I piped stiff royal icing and held the pieces in place until slightly set, and reinforced it with more royal icing along the joints from the inside and outside. 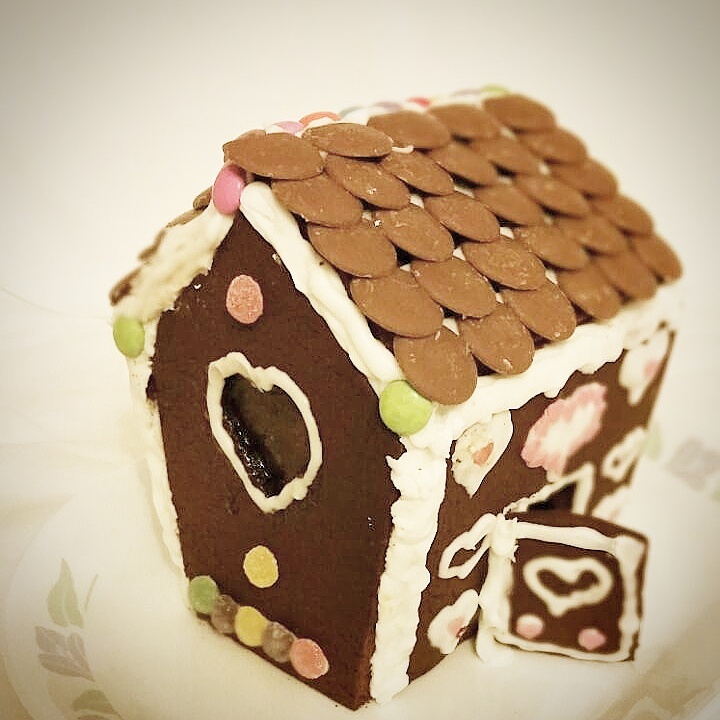 I wanted mine to look like my dream house from when I was a kid, unfortunately, my artistic abilities are still the same as when I was a kid. I would definitely live in that house! But will be happy to just eat it for now. 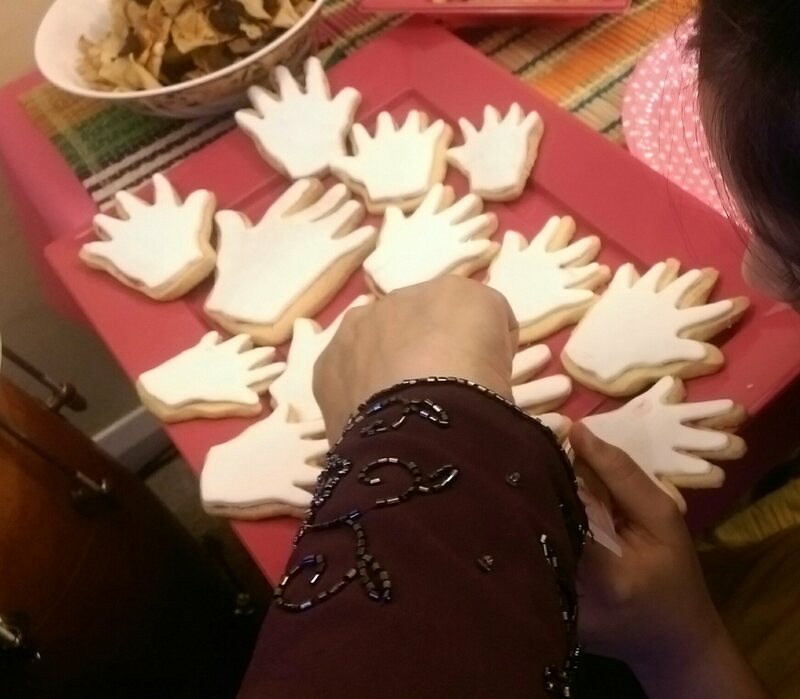 As the house I made was smaller than the one on the recipe, I used the extra dough to make cookies, which gave me an opportunity to use my new ‘baked by maryam’ stamp . 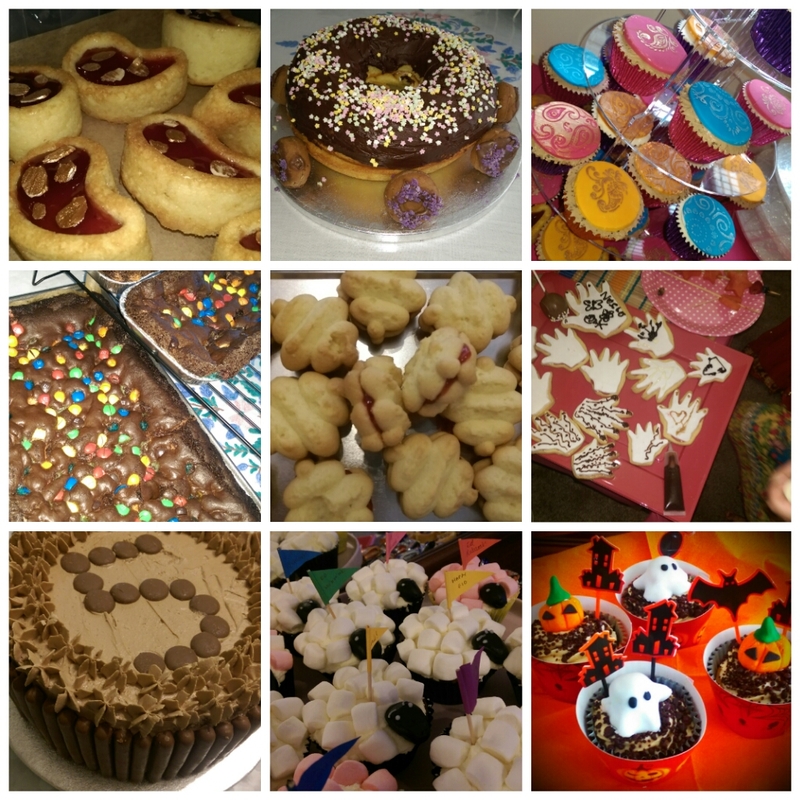 This entry was posted in biscuits and tagged biscuits, cookies, gingerbread, gingerbreadhouse, homemade, sweets on December 26, 2014 by maryambakes. Small bites of hazelnutty goodness sandwiched together with Nutella. 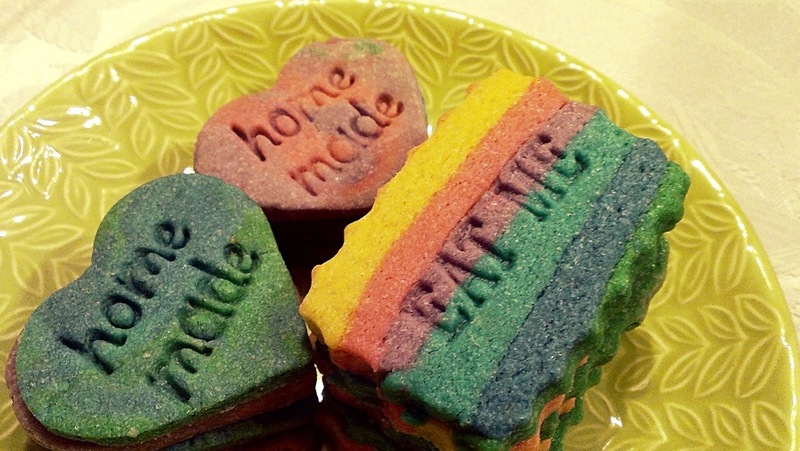 Before making these for myself, I had never actually tried these biscuits. 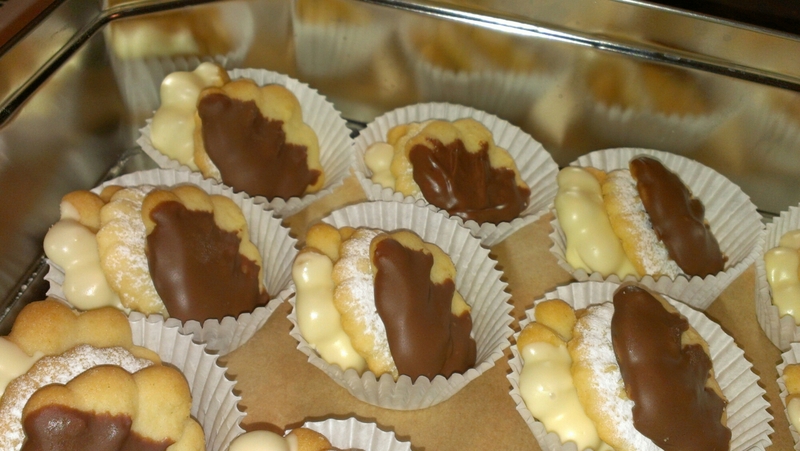 I had seen them on a cooking programme on TV, I didn’t even know their name, I just knew they were bite sized Italian hazelnut biscuits with a hazelnut cream filling. They looked and sounded delicious. I knew they would be the most amazing biscuits. All I had to do was find out what they were. Now I don’t normally read let alone attempt recipes that don’t have pictures. I was slightly, no very, disappointed that my new cookbook didn’t have a picture for every recipe. Yet something drew me to this recipe, and as I read the description I knew I had found them! The recipe is very straight forward. I used my hand held electric whisk, not food processor, as it’s less hassle to clean. The recipe says to leave the dough in the fridge for at least 30minutes. 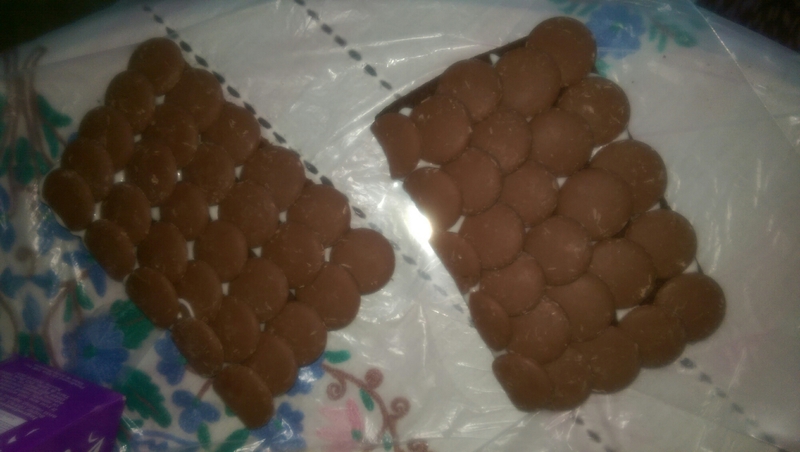 The first time I made these I left them in the fridge all day and still found it easy to form the biscuit balls. There was no way I was going to weigh out the balls for them to all be the same (I am marginally OCD but that’s just taking it to the next level!) 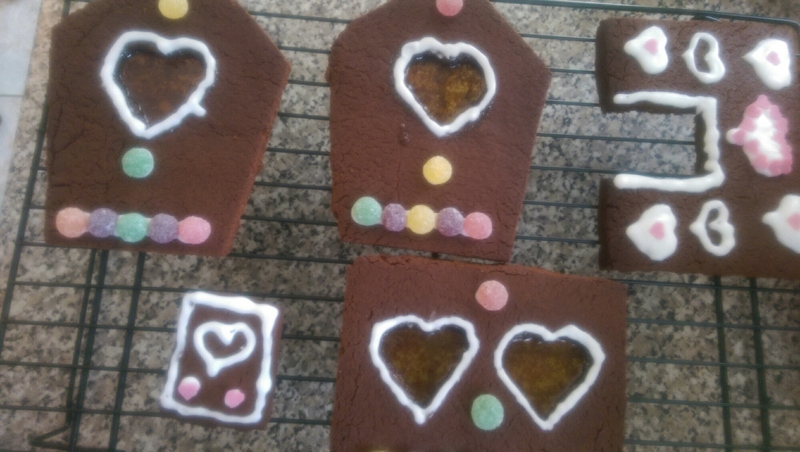 I think they look more homemade when they are slightly different shapes and sizes anyway. 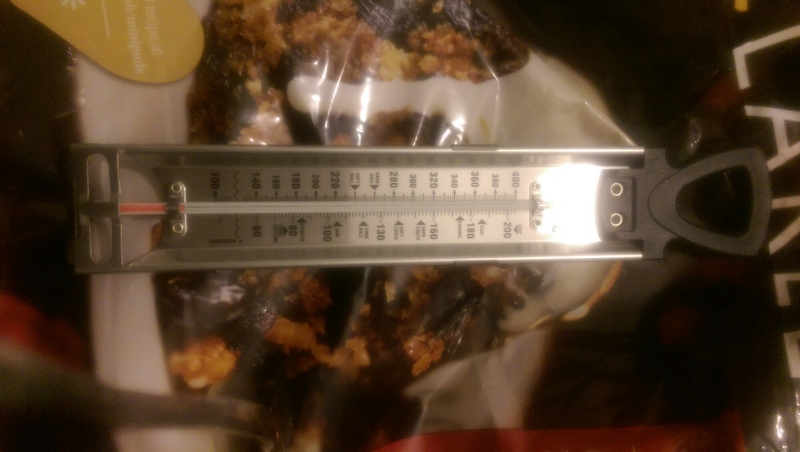 The recipe makes A LOT, which shouldn’t be a problem as they are incredibly moreish. 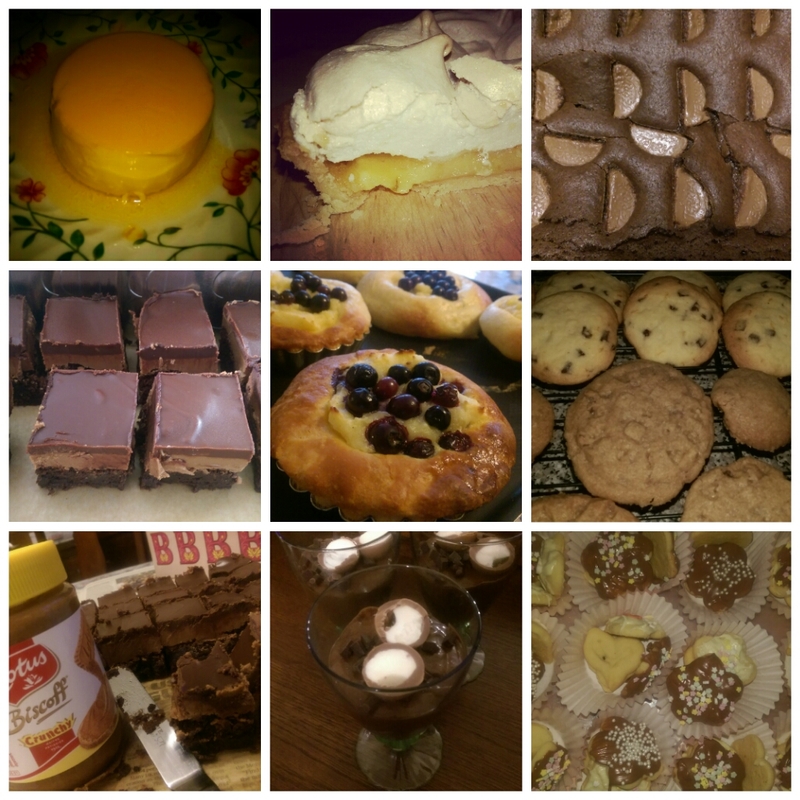 The first time I made these I froze half the dough and still ended up with about 40! The dough freezes very well and they tasted just as good than when made fresh. I also didn’t make my own gianduja filling, it is probably worth the effort, and I may attempt it in the future, but for now I’m sticking to Nutella. These are one of my favourite biscuits at the moment, crunchy, nutty and gooey (and bitesized, which means you can eat more without feeling guilty/greedy). 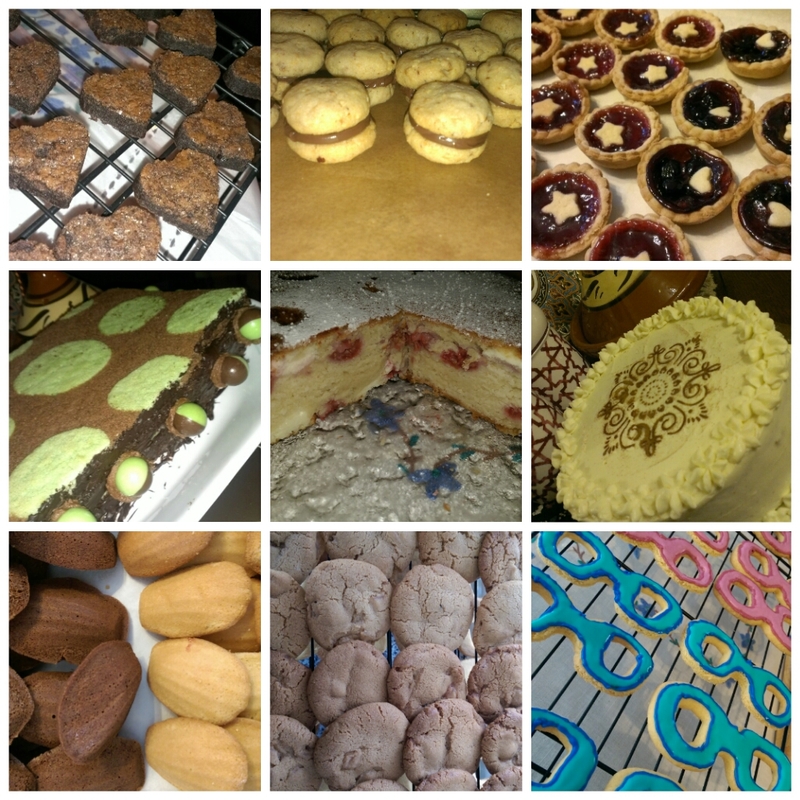 This entry was posted in biscuits and tagged biscuits, cookies, hazelnuts, homemade, nutella on December 24, 2013 by maryambakes. The holiday season is upon us (earlier and earlier so it would seem) when the supermarkets stock their shelves with yummy Xmas treats, gorgeous gingerbread houses, panatonne, stollen,mince pies, Yule logs and mouthwatering continental biscuits. 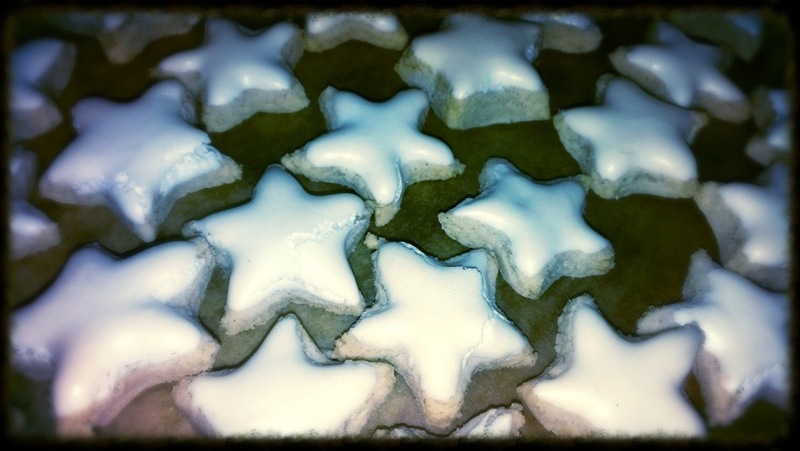 One of my favourites are ‘Zimtsterne’, German cinnamon star cookies. 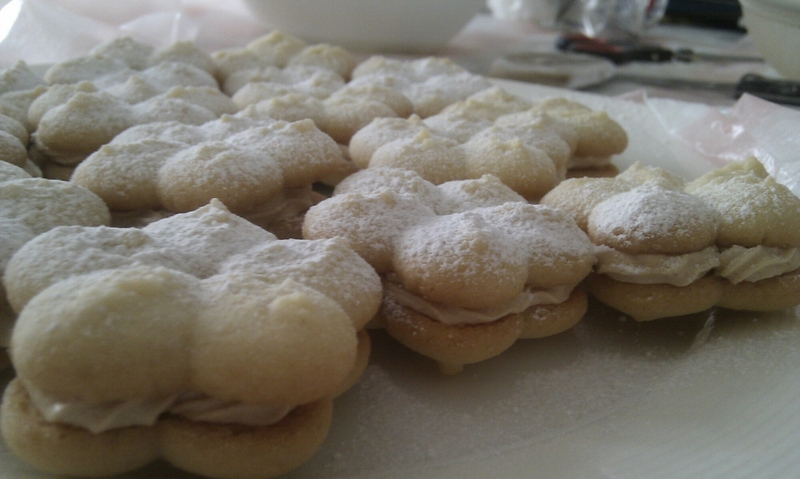 They are a macaroon type biscuit with a smooth,crunchy meringue topping. The warming cinnamon with the crunchy sugar is a definite winter winner. 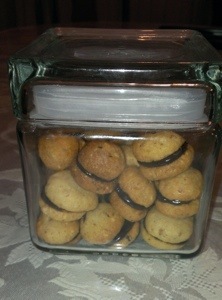 After seeing a recipe for them in the December Goodfood magazine I decided I had to make them. 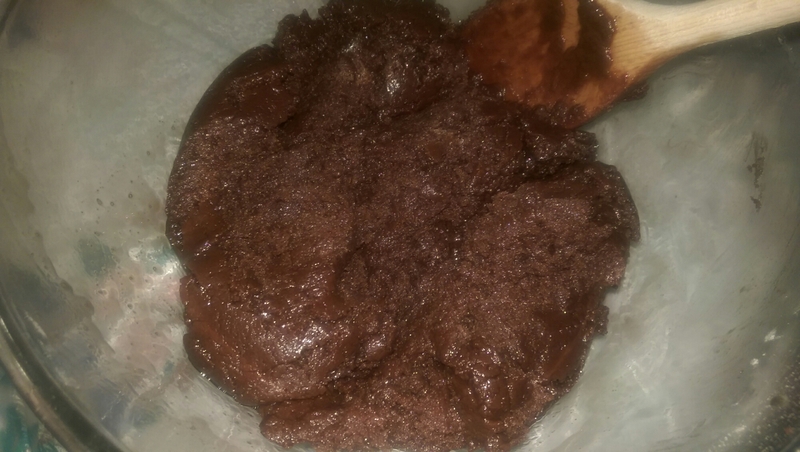 I had a look at a few other recipes online, they all seemed pretty similar, and this recipe yielded the least. To make the dough was fairly easy, I was slightly concerned about over/under whisking the egg whites, but I think I got the right balance. 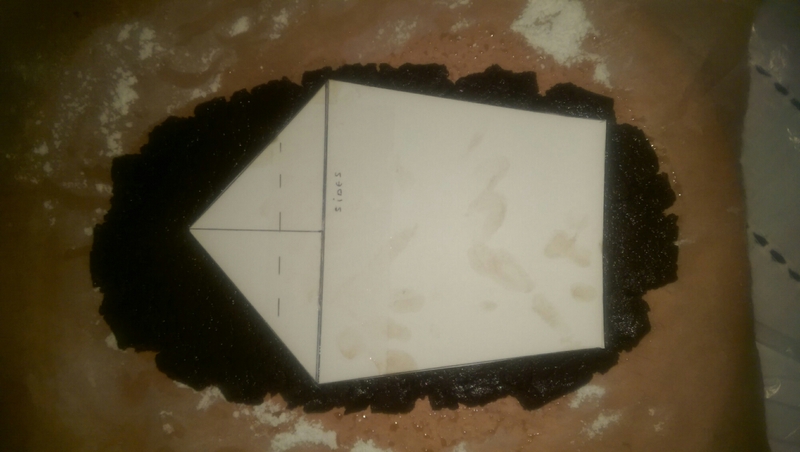 The instructions said to roll the dough between two pieces of greaseproof paper, this sounded abit fiddly to me, so I placed the dough to chill for a while and used plenty of icing sugar and didn’t have any issues. 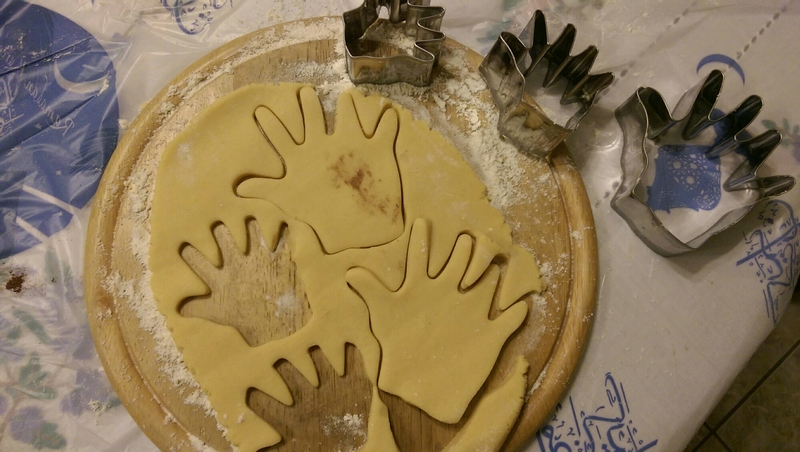 The stickiness of the dough did help when cutting the stars out as they stuck inside the cutter and were easily pushed out onto my tray. 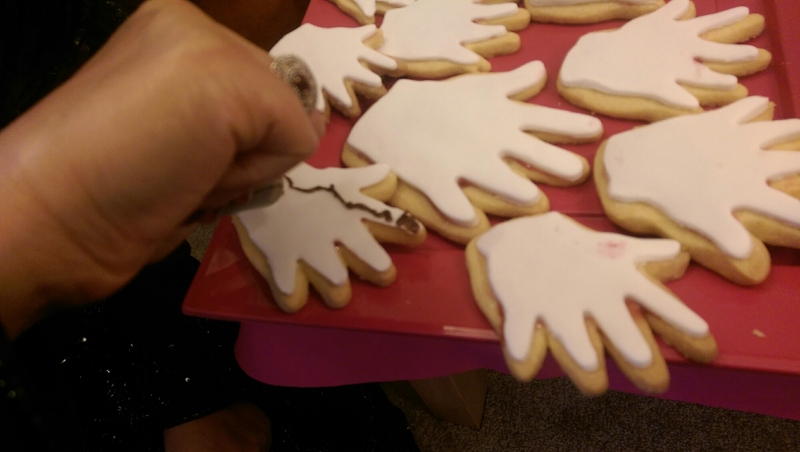 After about 12mins I took them out, I was disappointed to see the topping of a few of them had cracked. But on the whole they looked pretty good. Taste wise, the biscuits themselves were very nice, a soft yet slightly crunchy consistency,but could have done with more cinnamon, if I remake these I would add 1-2 teaspoons more. 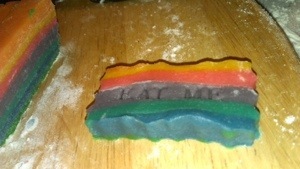 The topping had a nice crunch, but possibly I put too thick a layer as they were still soft underneath. Next time I would brush it on with a pastry brush. Or possibly in the shop bought versions I’ve tried they use royal icing? 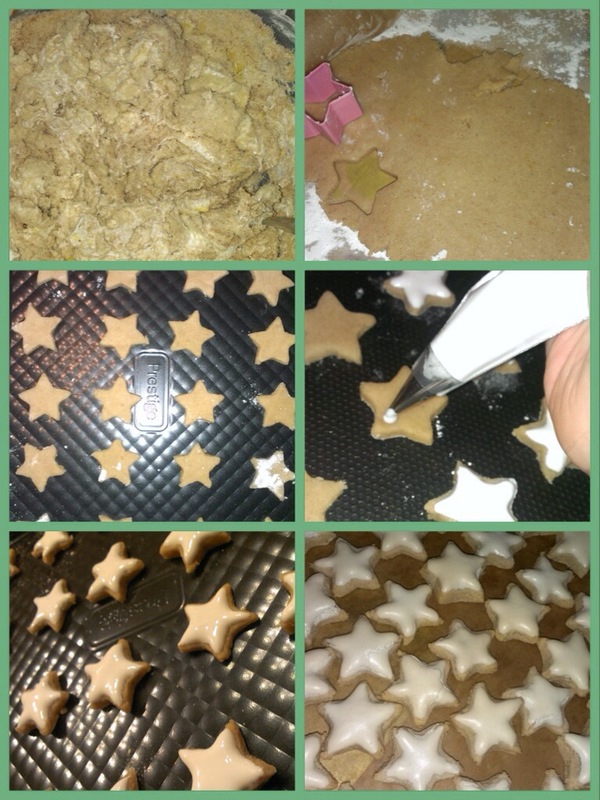 This entry was posted in biscuits and tagged biscuits, cinnamon, cookies, homemade, star cookies, winter, xmas, zimtsterne on December 17, 2013 by maryambakes. 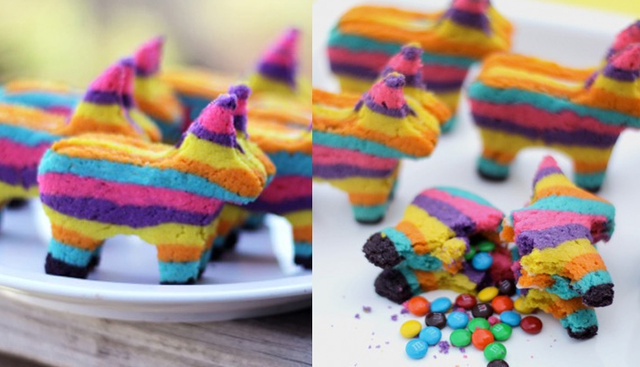 I’ve had my eye on rainbow cookies for sometime, after falling in love with some super piñata rainbow cookies. 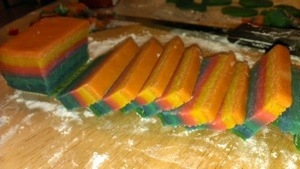 So when a tutorial popped up on my Facebook feed a few weeks ago, my rainbow cookie obsession was back. 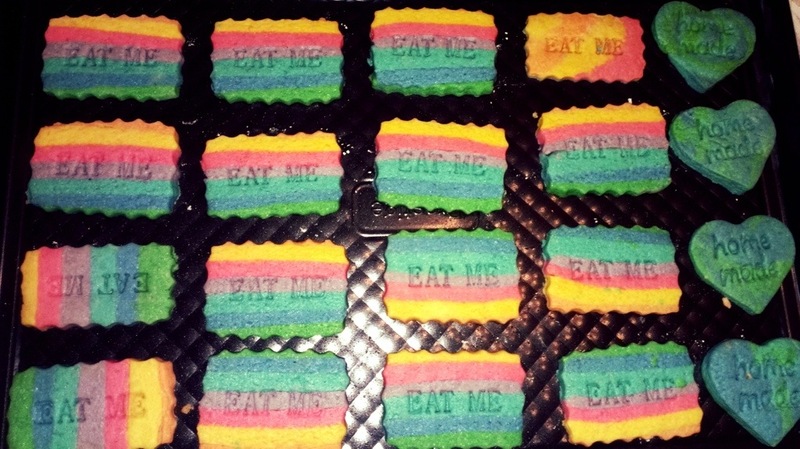 Being me, I couldn’t just do squarish rainbow cookies and decided it would be a great excuse to use my new cookie cutters (I got them from ebay). 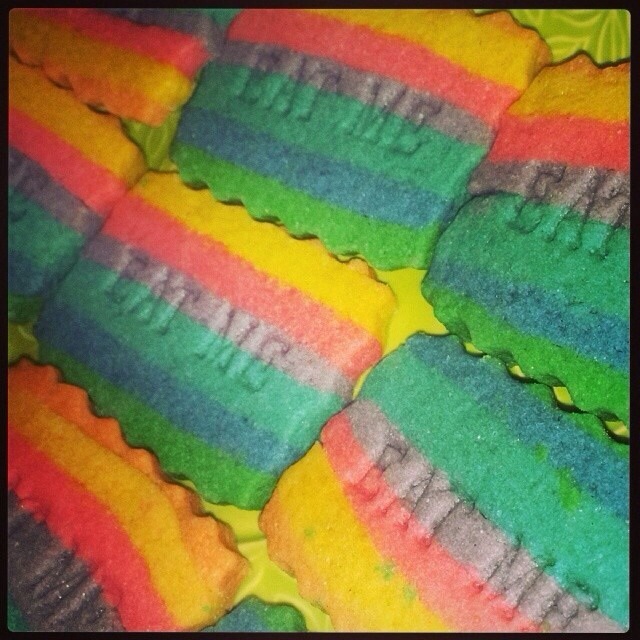 This entry was posted in biscuits and tagged biscuits, cookies, eatme, homemade, rainbowcookies on December 11, 2013 by maryambakes.